Scenarios are the cornerstone of Tenterhook apps. When the player selects a command (e.g. Examine) and a target (e.g. visual-mug), Tenterhook searches for a matching scenario and executes its actions. Below is a summary of the Scenarios editor. In order to create a new scenario, first select the appropriate command on the left. Then select a target (and secondary target when applicable) and define any actions that should be executed. Note: some commands include options like Walk to Target, which ensures the character walks to the target prior to executing any actions. When a scenario is executed, e.g. 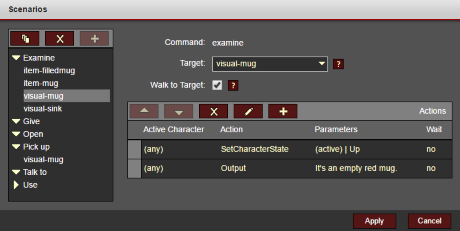 Examine sink, the Tenterhook engine finds the scenario with a matching command/target combination. If no match is found the command's default output is displayed. For example, the default output for Examine might be, "I see nothing special about it." When a matching scenario is found, all actions are processed and executed in the order they're listed. If a scenario requires conditional logic (e.g. checking the existence of flags on an item or character), you'll need to add a script to the list of actions.